much needed help regarding my 8 y.o jack russell terrier Jagger. Jagger was a very troubled rescue dog,for the 7 years we have had him he was constantly on edge,highly strung, yappy and agressive to other dogs.very territorial and stressed. Despite several attempts with local dog trainers etc,we were unable to ever get a handle on his issues. A friend suggested I speak with Rosee Riggs about the problems. 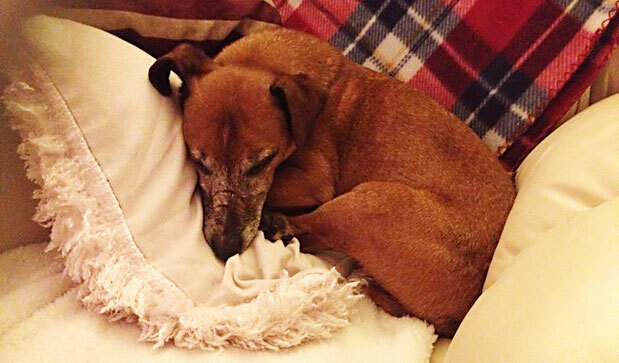 Rosee was more than helpfull and with some very simple,yet hugely effective advice,we have been able to help our little dog relax and let go of his stress. Rosee has shown me how to tune in to a dogs basic fundamental requirements. No tricks or time consuming techniques, just going back to basics and adapting a few everday situations to meet a dogs needs. Very simple changes that i had completely overlooked, that have given my dogs a much more relaxing,peaceful state of mind,and in turn, strengthened the positive relationship I have with my pets. Jagger enjoying his undisturbed sleep.